Last night as we left our hotel, one of the staff was throwing rice and what looked like tiny coloured Skittles onto the road. Set up behind her was a table with a vase of flowers, some incense sticks, spoons in a bowl of milky water and sheaves of coloured paper. We asked her was this a celebration – or basically what on earth was she doing? It was an offering at the end of the lunar month, which happens every month. Like the Moon Festival in October, it seems this is an ancient ritual to please the weather and store up good fortune. As we walked for our evening meal, almost every shop had its own version of the table set-up. Some were burning the sheaves of paper in a metal bucket in the gutter. The night air was filled with the scent of incense. 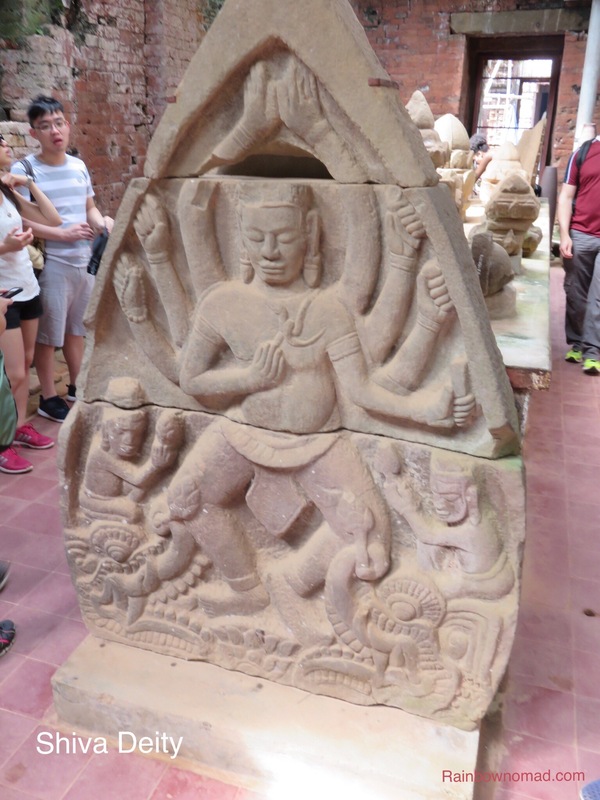 Yesterday we visited the ancient Champa Kingdom’s temple complex at My Son. 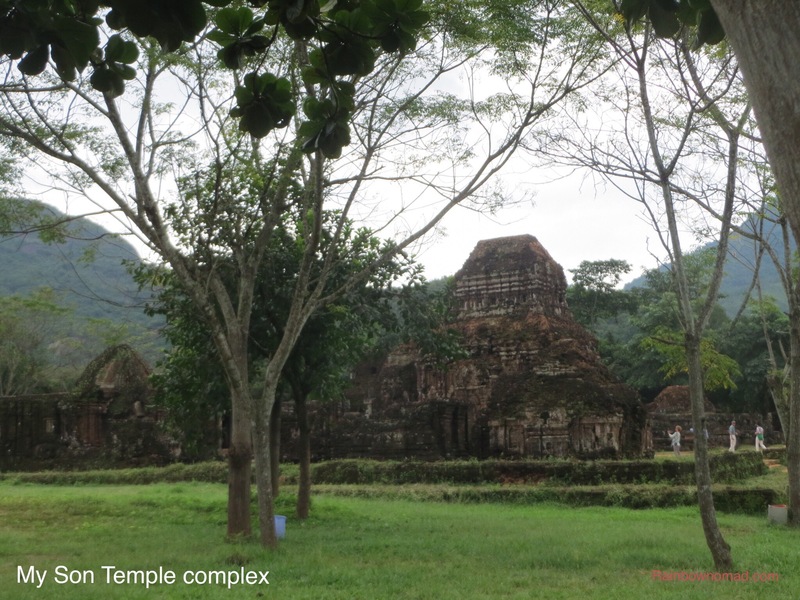 The Champas who originated in the coastal area of Danang from the 4th century, had little land so took to pirating. They travelled as far as Indonesia and India and thus were influenced by Indian culture. 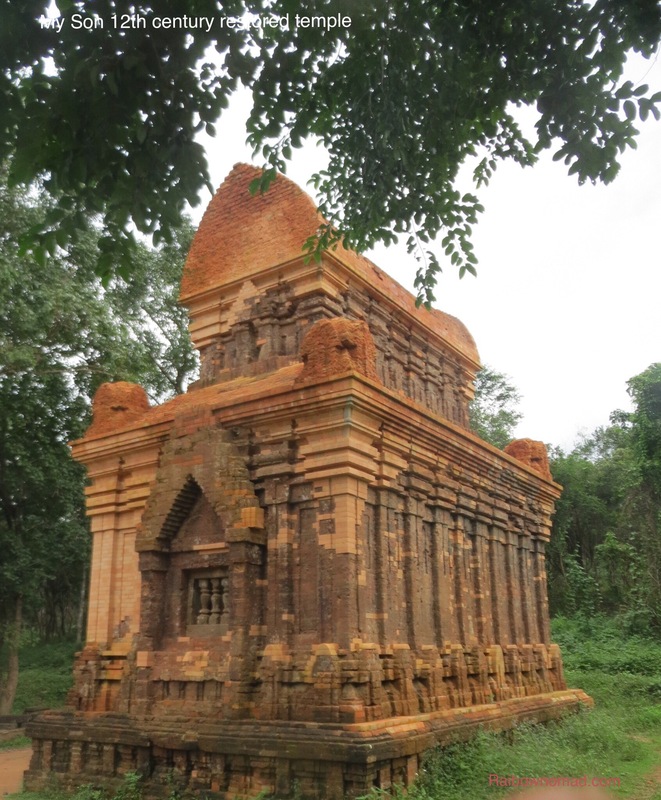 The Hindu temples at My Son are very similar to ones in Java, Burma and India and were built from the 4th to 12th centuries. Covered by jungle for centuries, they were re-discovered by a Frenchman, Parmentier in 1901 and partially restored. Fortunately he and other archeologists photographed the restorations because they were bombed in the 1960’s during the American war. Our guide, Tien explained how My Son represented holy mountain, holy ground and holy water all facing and flowing in the right directions, so Shiva the Hindu god would be pleased. 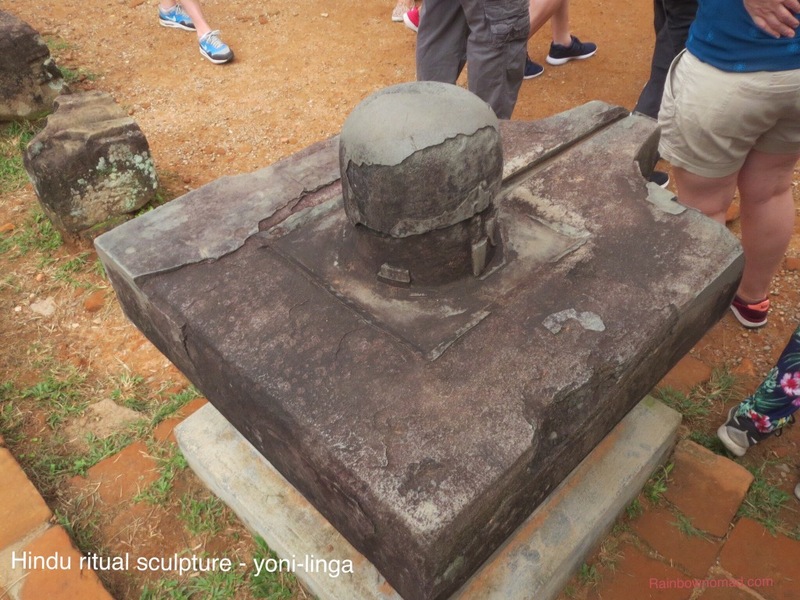 The yoni-linga (roughly yang/yin or female/male) structure was the holy high point in the temple. Tien also pointed out water filled bomb craters. We were pleased to hear 25% of our entrance ticket would go towards ongoing restoration. 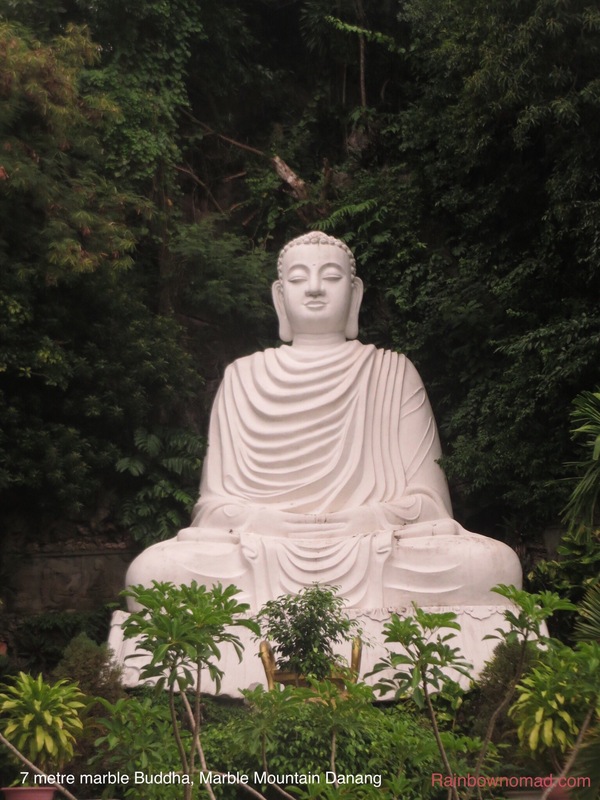 Today we visited the Marble Mountains of Danang and became immersed in Buddhism. Fortunately we took our hiking sticks because the drizzle set in as we embarked up the marble steps to the first pagoda. It was pretty slippery! The limestone rock formations which form the mountains are filled with caves, nooks and crannies and an active Buddhist monastery, where we heard the venerable monks chanting. One enormous cavern, where we could run lucky water on the top of our heads was used as a hideout for the Viet Cong and never discovered by the Americans, even though this mountain was also bombed! Many people were lighting incense and bowing to Buddha. Our young guide Ly wanted to know how old we were, as we were certainly slower than our young Netherlander and Israeli companions. He was most impressed that Fred was his oldest customer to date. The iPhone recorded we had climbed 19 stories by the end of 2.5 hours. Phew! According to official statistics, only 16% of the population practice Buddhism and 45% Vietnamese people practice folk traditions, based on Confucianism and Taoism. 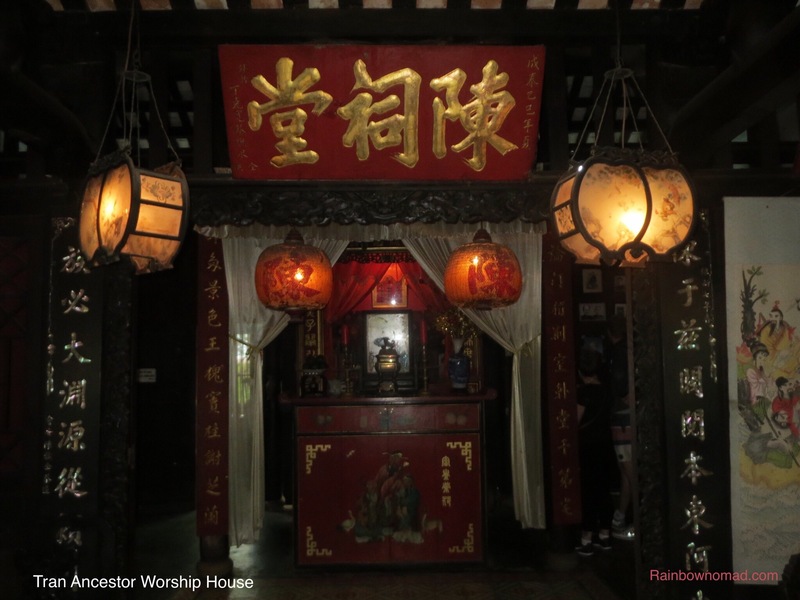 Part of this folk tradition includes ancestor worship and we visited the Tran Family Ancestor House, the Tran family having lived there since 1700’s. 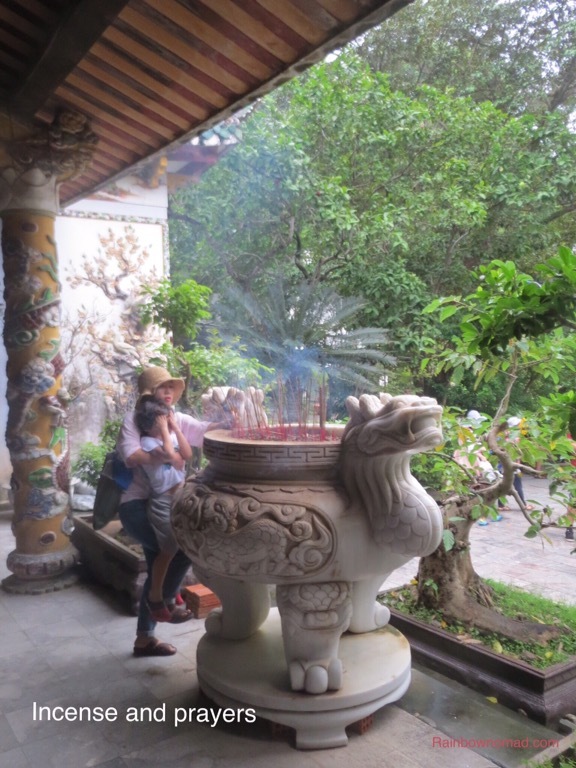 The young Tran woman who was our guide explained how the house entered from the noisy street, via tranquil garden was built along Japanese and Vietnamese architectural styles. There was a shrine in the house with wooden boxes carrying the ashes of each of the first 5 generations of Trans. On each ancestor’s birthday, the family make a little celebration. 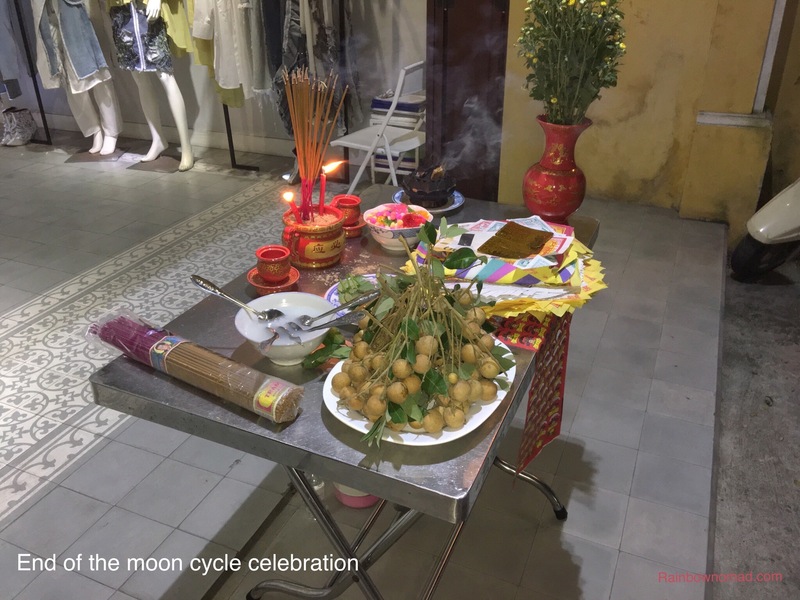 We thought this was quite a nice idea, along with the end of the lunar month celebrations. It was certainly no less strange than our own pagan influenced Christmas celebrations. 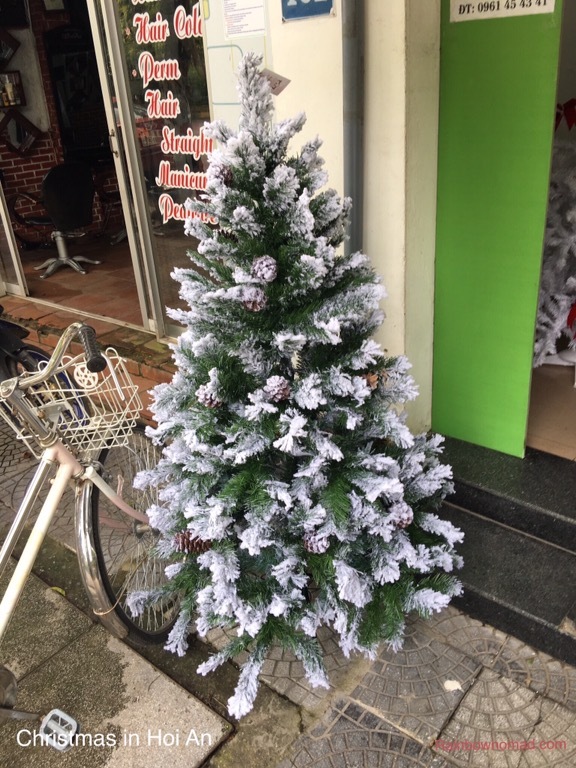 To top off our religious investigations and right after we witnessed the rice throwing into the street to mark the end of November’s moon, we came across a Christmas shop, playing jingle bells!